There are various goals that marketers aim to achieve with their email marketing; this could be to increase sales, strengthen relationships or drive more traffic to your website. There are certain techniques you can use to drive more traffic to your website, helping you to increase conversions, which we’re going to discuss in this blog. It is a waste of your time and money to communicate with a list of contacts who are simply not interested in your content or your product or service. Having a clean list of engaged contacts that you can nurture and drive towards your website is going to get you far better results. Asking your contacts to double opt-in to your emails, will ensure that they really are interested in your offering and genuinely want to hear from you and these are the people who you’re likely to be able to drive towards your website. Also, by making the unsubscribe button as obvious as possible, you’ll filter out the contacts that aren’t particularly engaged with your emails and you’ll be left with a list of high-quality subscribers. There are hundreds of different ways you could segment your list and doing so will without a doubt improve your email marketing. You could segment your list according to your contacts’ location, industry, age or interests for example. This would enable you to create more targeted content that will appeal to individual lists. For example, your tone of voice and the type of content you’d send to a teenager would be very different to the content you’d send to a 65 year old. If, for example you’re in the hotel or restaurant industry with multiple sites, your email marketing should be location specific rather than generic. By segmenting your list, you’ll ensure that your targeting the right people with the right message and therefore increase your chances of driving more traffic to your website. Great content is at the heart of effective email marketing. If you don’t send out emails that either engage, educate or entertain your recipients, they will stop reading and certainly won’t click through to your website. If however, you can keep them engaged week after week with content that resonates with them or teaches them something, you’ll drive more traffic to your website and increase your sales. If you don’t tell your readers what you want them to do after reading your email, the chances are they won’t do anything at all. Drive more traffic to your website by including a clear call to action at the end of the email and where appropriate, in the body of your email too. A button is normally more effective than a hyperlink so always ensure you include at least one, large button that your readers can’t miss. Everyone loves a freebie, so direct your readers to a landing page on your website to access a freebie. This could be an eBook, an article, a guide or a video- anything that your readers will find valuable. If you’re not measuring the success of your email marketing, you’re missing a trick. The click-through rate is the email marketing metric you should be keeping track of if your goal is to drive more traffic to your website. By taking notice of this metric with every email you send, you can make improvements to your emails. Do you need to increase the size of your call-to-action? Or the position? Or the wording? Or is it the content itself that’s letting you down? What content received the most engagement? When you know the answer to this you can begin to see what works and what doesn’t. According to Adestra, 59% of email opens now occur on mobile, therefore if your emails aren’t responsive and are all over the place when opened on a mobile, your recipients are going to hit delete immediately. So, before you send out your email campaign, always test how it looks on mobile as well as on desktop. 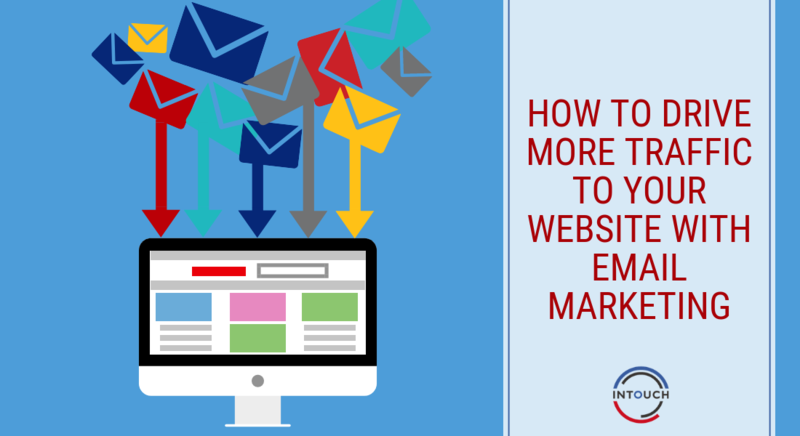 So there are 7 tips to drive more traffic to your website through email marketing. Take these tips on board when you’re ready to send your next campaign and you’re sure to see incredible results! Nice post! Specially the last point. Optimize it for mobile. Many people don’t optimize email for mobile.